Qwikcilver – now to the Power of X! 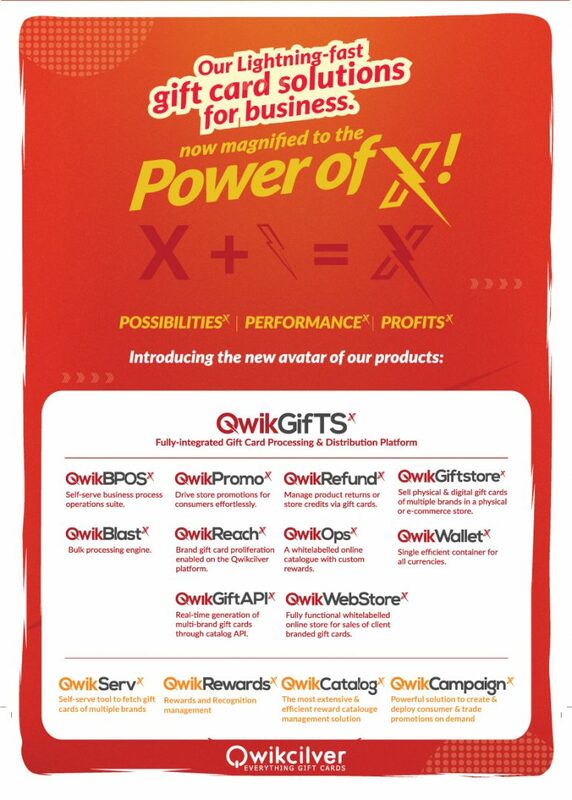 Pioneers of the Gift Card revolution and the power behind the Gift Card programs of more than 200 brands worldwide – this is how Qwikcilver has been known as and we are here to make people, brands and businesses across the world smile and celebrate in pure delight! Committed to a relentless pursuit of futuristic and cutting-edge technology in the gift card category, Qwikcilver now brings you a roster of new and optimized products that enable you and your brand to not just impress your customers, partners, employees and stakeholders, but to also impress, inspire and retain them. With the power of innovation and backed by the speed and precision of the lightning bolt, we present to you, products that give you Growth, Efficiency and Possibilities to the power of X!